December 3, 2013 - Hamilton School District. 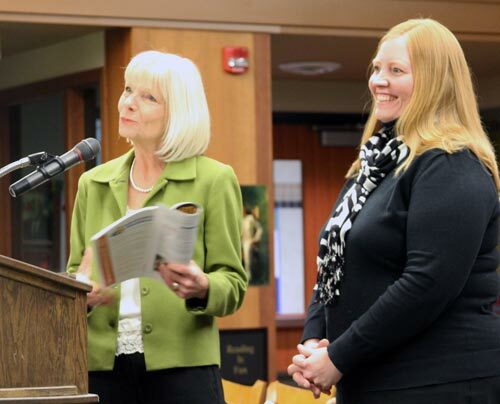 Hamilton School Board members recognized Templeton Middle School social studies teacher Rhonda Watton for being recipient of the 2013 Outstanding Middle Level Social Studies Teacher of the Year from the National Council for the Social Studies (NCSS). Principal Patty Polczynski described Watton’s accomplishments and credited her for being an excellent teacher who stretches kids’ thinking and makes connections between what they are learning in eighth grade history class to current events. Watton was presented with the award Nov. 22 during the NCSS Annual Conference in St. Louis. She also presented a session for teachers from throughout the country who were in attendance. Hamilton School Board members approved revisions to the district’s Business Education curriculum. Instructional Services Supervisor Katherine Little reported that the changes included course revisions. The district will use the CESA #6 Strong model as its framework for implementing Educator Effectiveness. The district was required to declare by Nov. 30 whether it would use the Danielson framework developed by the state Department of Public Instruction (DPI) or an alternate model. Human Resources and Organizational Development Director John Roubik reported that administrators and members of the district’s Supervision-Evaluation Committee reviewed DPI and CESA #6 models. The Strong model was recommended because CESA #6 had a more fully developed plan for professional development, allowed the district to customize feedback and its electronic management platform is operational in many districts across the state. The Teachscape platform used with the Danielson model is still under development. Costs for each system was the same. Templeton Principal Patty Polczynski reported on her school’s site planning. She provided an overview of successes and areas that need additional focus, and noted an increase in student mobility rate which is the percentage of students who move in or out of the school. Strategies include using disciplinary-specific reading strategies to comprehend text and writing strategies to improve proficiency including vocabulary specific to each discipline. The strategy involves developing and deepening students’ critical thinking and problem solving skills through classroom activities. This will be addressed by increasing student engagement in a positive school environment to increase personal commitment to learning and improve social competencies. After review, Templeton’s Site Planning Committee concluded that the school’s tactics are aligned with the district and will help increase student achievement and commitment for their own learning. Appointed Warren Fisher as a Maple custodian and Michael Figueroa as a Templeton custodian, both effective Dec. 11.